Accentuate the elegance of your home while bringing the beauty of the outdoors inside with this gorgeous table linen collection. 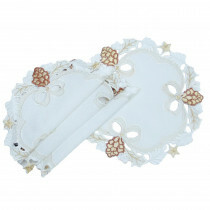 Golden gilded pinecones and holly twigs border the scalloped edges. while a muted background promises to compliment any decor. Perfect for a gift.